A Chromebook is undoubtedly any Google lover’s delight and is powered by the Chrome OS. Irrespective of the manufacturer, this special laptop has three remarkable features that can in no way be overlooked. First, it comes with an inbuilt antivirus that updates itself automatically so that your system is always safe and secure. Second, thanks to the cloud storage, you never run short of space and get your files backed up automatically with most Chromebooks. Third, it comes preloaded with all of Google’s favorite apps and gives you access to a whole lot of other apps through the Play Store. With no setup required, all that you need is a Google account to start using your Chromebook. 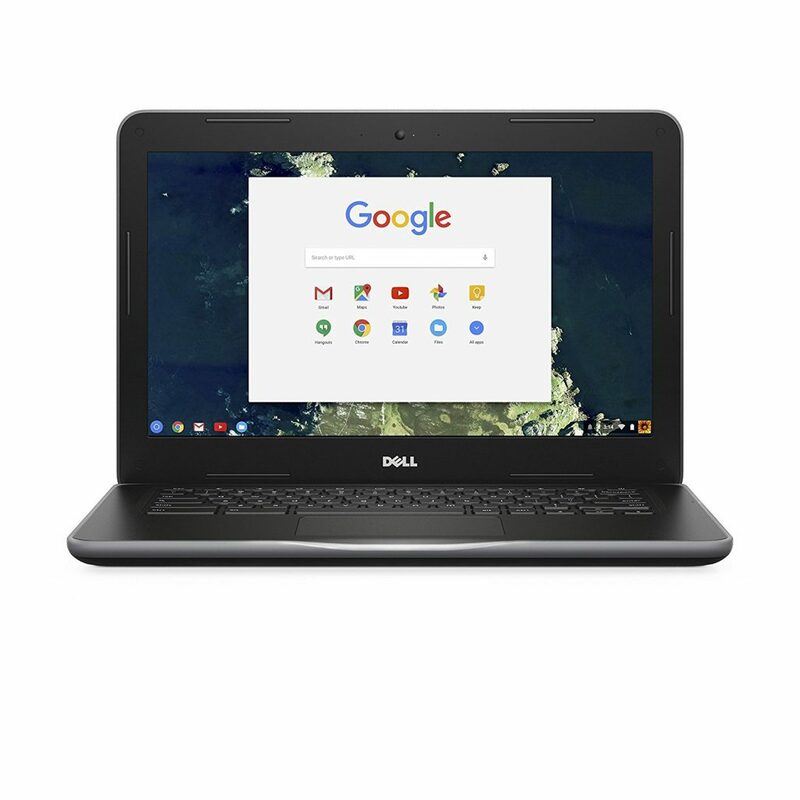 Most Chromebooks are conveniently priced so that this need not be a hindering factor in your buying decision. 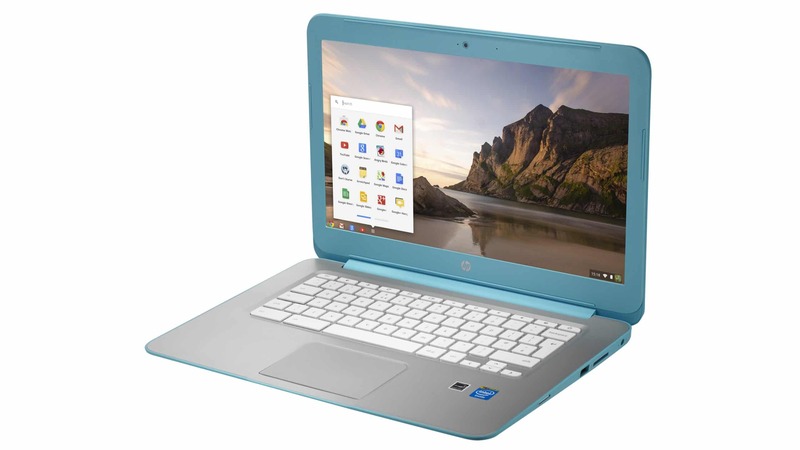 This article gives you the list of some of the best Chromebooks under $500. 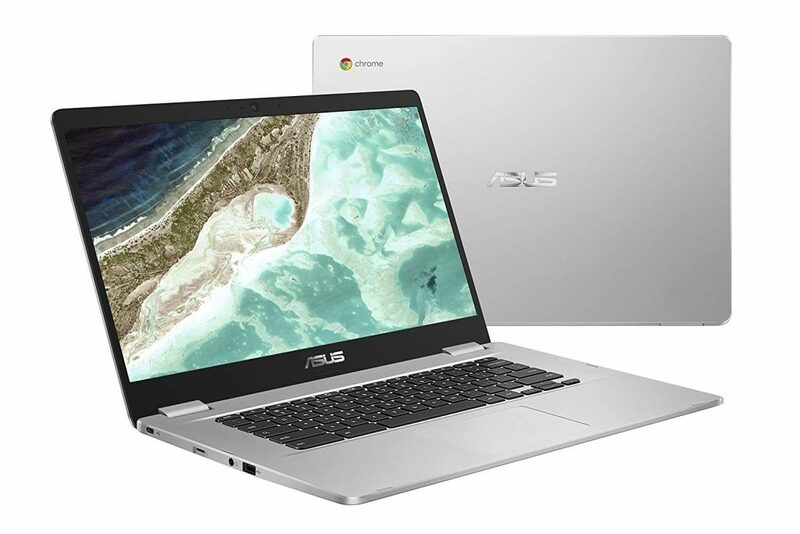 The Asus Chromebook comes with an 11.6” HD screen with 1366 x 768p resolution and anti-glare display and a 180 degrees hinge. This laptop has 4 GB RAM, a dual-core Intel Celeron processor that clocks at a maximum frequency of 2.48 GHz and an Intel HD Graphics coprocessor. It has two variants of flash storage -16 GB and 32 GB. The device supports 100 GB of Google Drive space. The dark blue and silver system encompasses a spill-resistant keyboard, two USB 3.0 ports and a HD webcam. The system allows you to avail Bluetooth 4.2, WIDI and Wi-Fi 802.11 ac connectivity options. It boots up very fast and renders consistent fast performance. The laptop has a rugged design with easy grip handles and reinforced rubber guards. The Chromebook is equipped with a lithium polymer battery that has an average battery life of 10 hours. 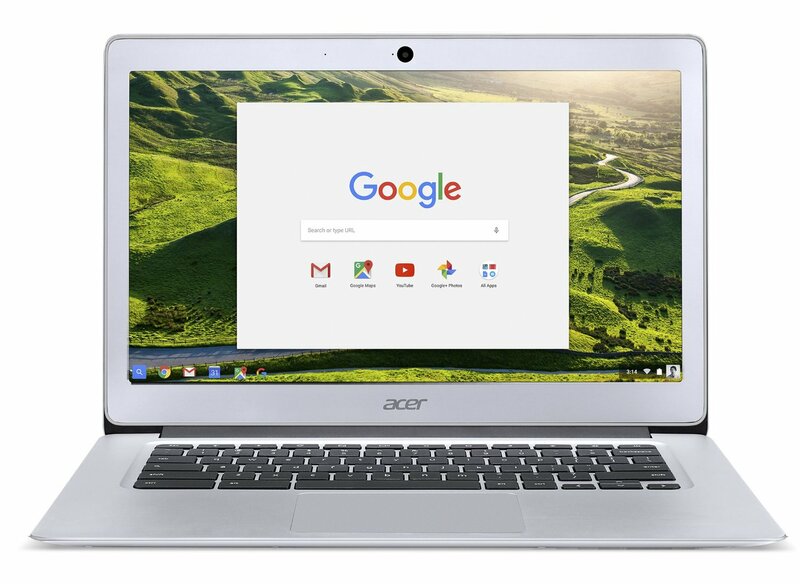 The Acer Chromebook comes with an IPS 15.6” Active Matrix TFT Color LCD HD screen with 1366 x 768p resolution, an energy efficient LED back-light, ComfyView display screen technology and Corning Gorilla Glass. The laptop features 2 GB RAM with 16 GB flash storage, a two core Intel Celeron processor with a clocking frequency of 1.6 GHz and an Intel HD graphics co-processor with shared memory. The white system is integrated with a HD webcam, a microphone, two stereo speakers, an SD memory card reader, a TouchPad pointing device, a HDMI port and two USB 3.0 ports. The device supports Wi-Fi 2 x 2 802.11 a/b/g/n/ac and Bluetooth 4.0 connectivity modes. 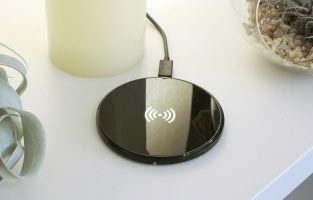 It is backwards compatible with other Wi-Fi hotspots and networks. The Chromebook works with a lithium polymer battery, which has an average life of 12 hours. 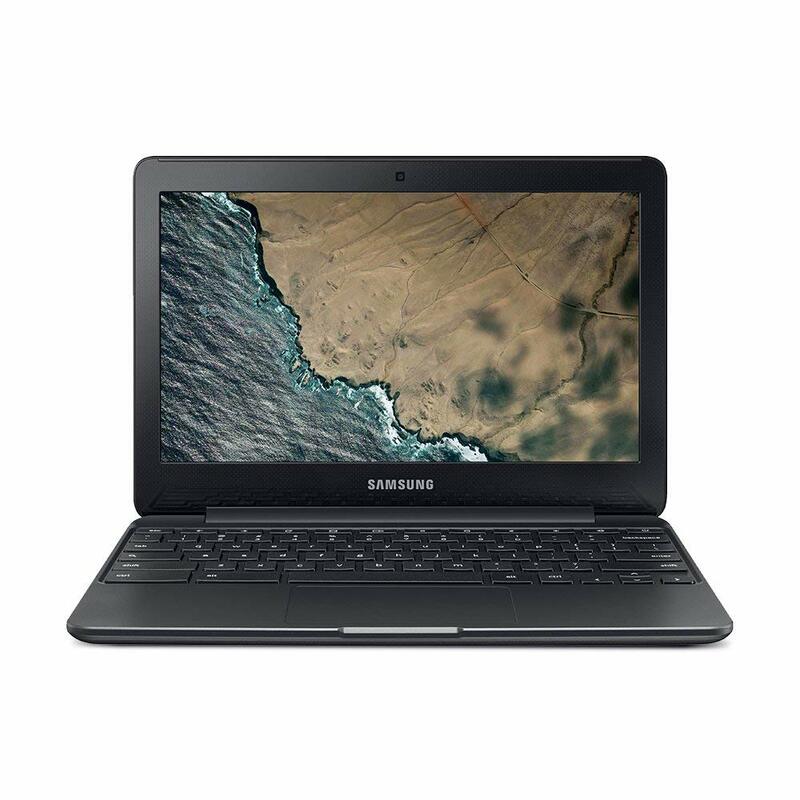 The Samsung Chromebook comes with an 11.6” LED screen with 1366 x 768p resolution and a reclining angle of 180 degrees. The laptop has 4 GB RAM, 16 GB internal storage, a 1.6 GHz Intel Celeron processor that can boost up to 2.48 GHz and an Intel Graphics co-processor. The screen features a brightness of 220 units. 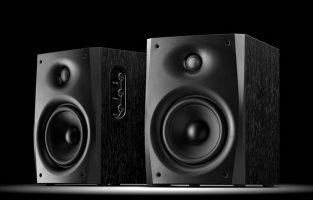 The metallic black colored system has a water resistant 74 keys keyboard, a USB 2.0 port, a USB 3.0 port, a HD webcam, two 1.5 W mobile audio speakers, a HDMI port, a headphone out/mic in combo port and a micro-SD card reader. The Energy Star certified device supports Wi-Fi 2 x 2 802.11 g and Bluetooth 4.0 connectivity. The Chromebook works using a two-cell lithium ion 33 Wh / 4,400 mAh metal battery that works for 11 hours on a single charge. It comes along with a quick start guide, a software guide and a warranty card that offers a warranty period of one year. The HP Chromebook comes with a 14” HD SVA LED back-lit screen with 1366 x 768p resolution and BrightView technology. The laptop encompasses 4 GB RAM, 16 GB flash storage, an Intel Celeron dual-core processor that clocks at 2.16 GHz and an Intel HD Graphics co-processor. The silver colored device is fitted with a micro-SD card reader, HP TrueVision webcam with microphone, two stereo speakers, two USB 2.0 ports, a USB 3.0 port and a headphone/microphone combo jack. The system supports a combo connectivity of Bluetooth 4.0 and Wi-Fi 2 x 2 802.11 ac. 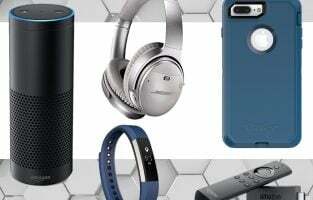 It operates using a lithium polymer battery with an average life of nine hours. 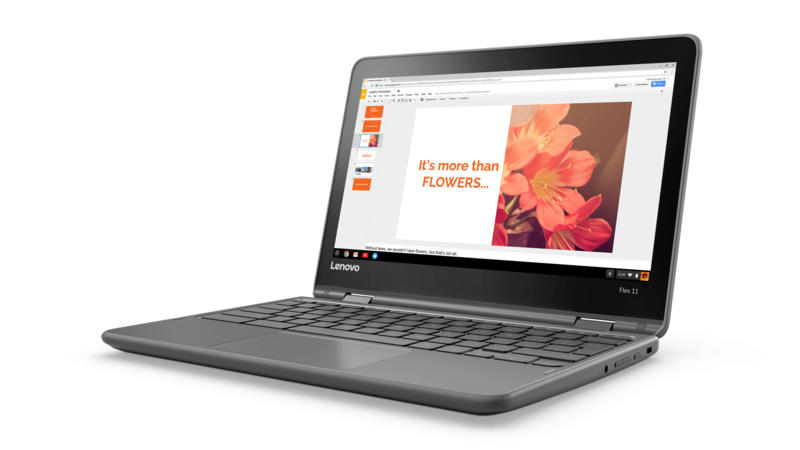 The Lenovo Chromebook comes with an 11.6” 10-point FHD IPS multi-touch and anti-glare display with 1366 x 768p resolution and 360 degrees convertible functionality. The 2-in-1 convertible laptop has 4 GB RAM, a 1.7 GHz clocking MediaTek processor and an integrated MediaTek graphics co-processor. The device offers two types of flash storage – 32 GB and 64 GB. It features 100 GB cloud storage through Google Drive. The blizzard white system is integrated with a 720p HD webcam, a couple of 2 W speakers, a USB Type C port with HDMI pass through, a HDMI port, an audio combo jack, a USB 3.0 port and a SD card reader. It supports Wi-Fi 2 x 2 802.11 b/g/n and Bluetooth 4.1 connectivity types. 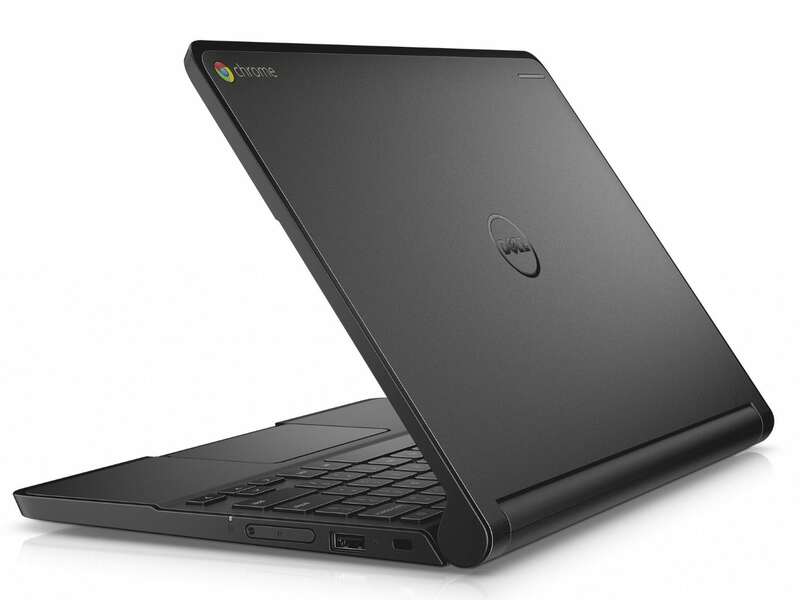 The Chromebook works with a lithium metal battery that renders an average working time of 10 hours on a single charge. 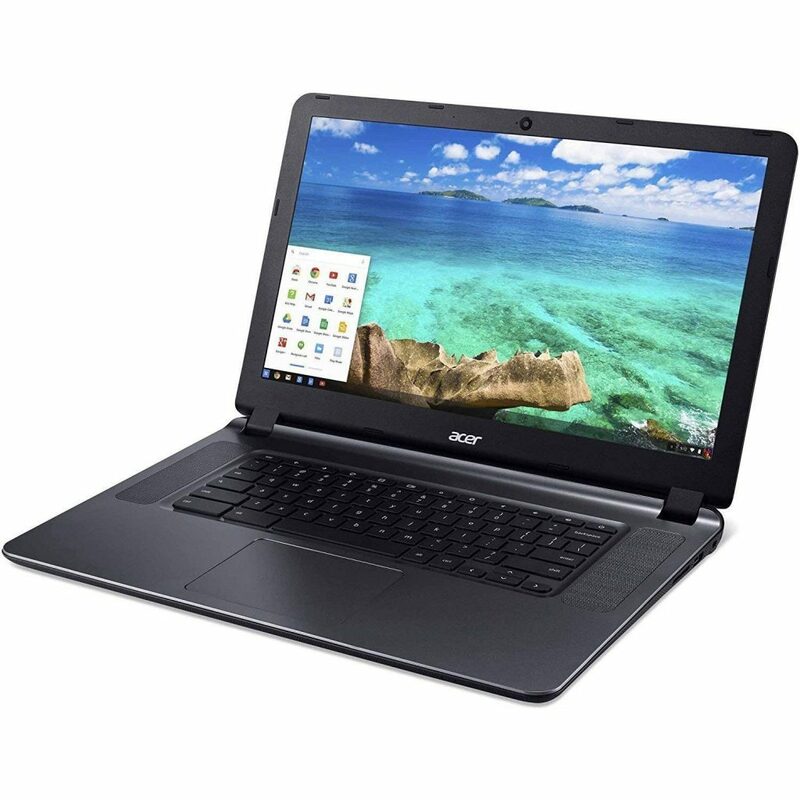 The Acer Chromebook comes with a 15.6” Full HD multi-touch 10-point LCD screen with 1920 x 1080p resolution and Corning Gorilla Glass, as well as LED back-light and IPS display screen technologies. The screen has an aspect ratio of 16:9 and supports image auto rotation. The laptop comprises inbuilt 4 GB RAM, 64 GB flash storage, an Intel Pentium quad-core processor clocking at 2.5 GHz, an Intel HD Graphics co-processor and 100 GB of Google Drive space. The black colored system incorporates a back-lit keyboard, a 720p HD webcam with high definition recording and 88 degrees wide angle lens, two upward facing stereo speakers, a 360 degrees dual torque hinge to place it in four different modes, two USB 3.0 ports and two USB 3.1 Gen 1 Type C ports. It supports Wi-Fi 802.11 a/b/g/n/ac and Bluetooth 4.2 connectivity modes. The Chromebook works with a 3-cell 4,670 mAh lithium-ion battery that has an average life of 13 hours. 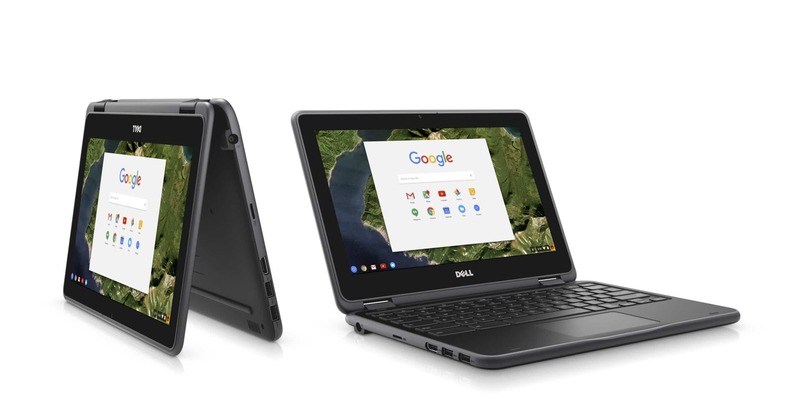 The Dell Chromebook comes with a 13.3” non-touch LCD HDF screen and 1366 x 768p resolution, Corning Gorilla Glass and 180 degrees hinge. The laptop encases 4 GB RAM, 16 GB internal storage, an Intel Celeron processor with 1.6 GHz clocking frequency and an Intel HD Graphics co-processor. It comprises a suite of Google apps related to education for the benefit of both the teachers and students. The black colored system features a spill-resistant and sealed keyboard, a three-color LED Dell Activity Light visual indicator, a Noble Wedge Lock slot, a USB 3.0 port, two USB 3.1 Gen 1 port, a full-size HDMI port, a combo headphone/microphone jack and a USD card reader. The device offers connectivity support through Wi-Fi 2 x 2 802.11. 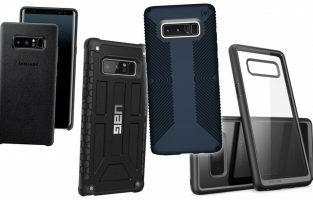 It has rubberized edges with drop protection that contributes more towards the ruggedness. The Chromebook works with a four-cell 56 WHr lithium-ion battery that has an average working life of 10 hours on a single charge. 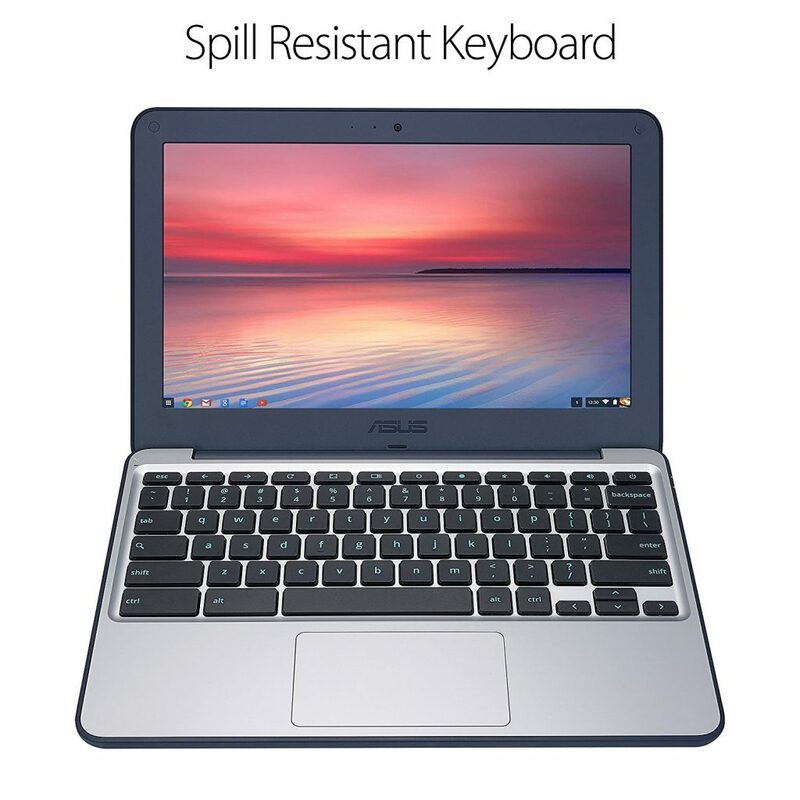 The Asus Chromebook comes with two options of screen size – 14 inches and 15.6 inches. Both versions incorporate NanoEdge displays with anti-glare coatings to minimize reflections and a 180 degrees hinge for flat positioning to share content easily. 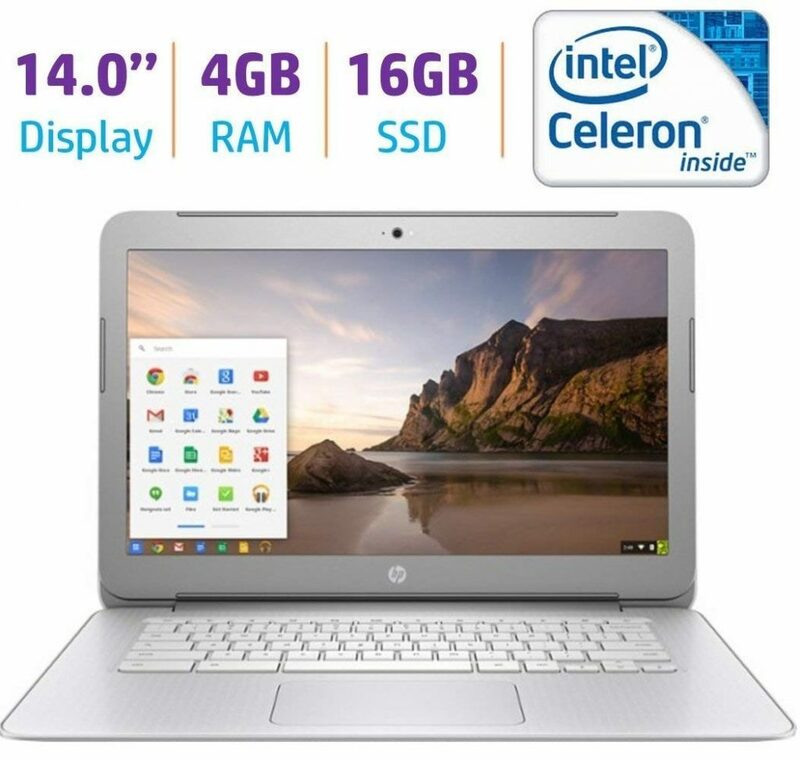 The laptop has 4 GB RAM, 32 GB flash storage, an Intel Celeron dual-core processor with 2.4 GHz maximum clocking frequency, an Intel HD Graphics co-processor and 100 GB Google Drive space. The device incorporates a 6 mm ultra narrow bezel, two full-function reversible USB Type C Gen 1 ports, two USB 3.0 Type A ports, an audio-in/headphone-out combo jack, a HD webcam, two high-quality stereo sound speakers and a micro SD/SDXC card reader. It supports Bluetooth 4.0 and Wi-Fi 802.11 ac wireless data networks. The silver and black system has a metallic finish that gives it a classy look. 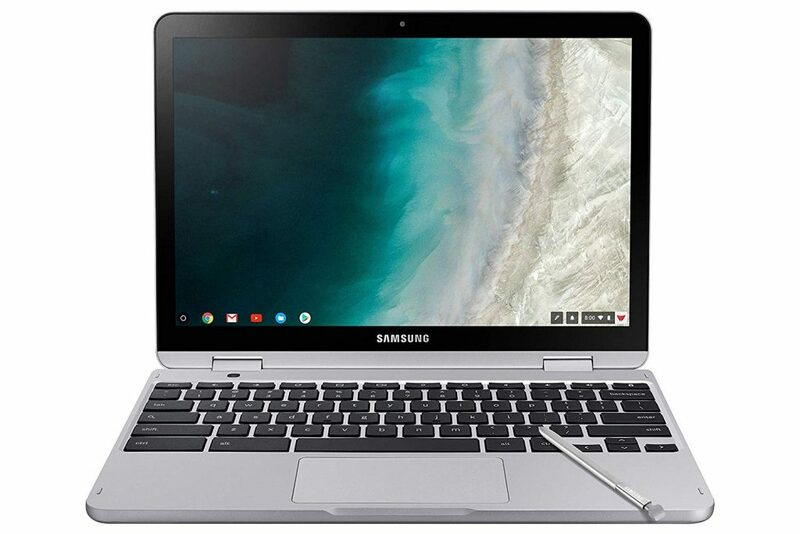 The Chromebook functions using a two-cell lithium ion 38 WHr battery that lasts for up to almost 10 hours on a single charge. 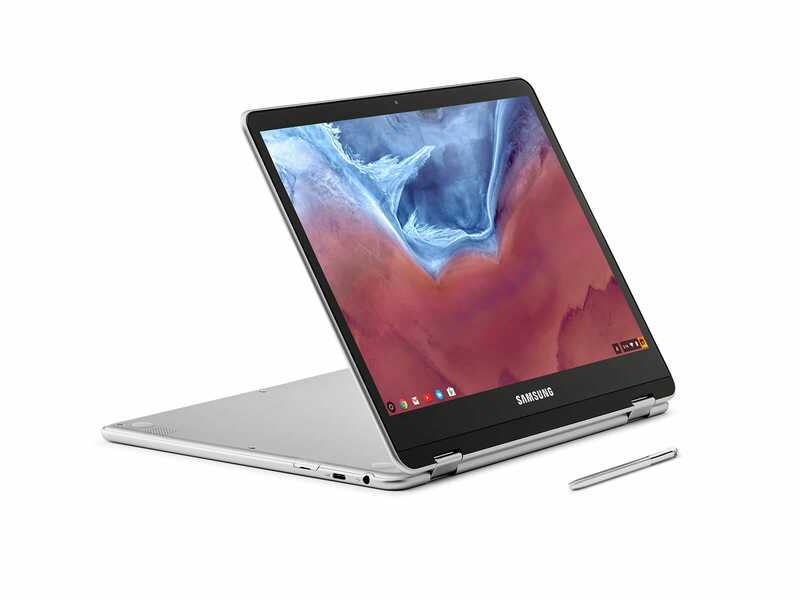 The Samsung Chromebook comes with a LED lit 1920 x 1200p resolution 12.2” FHD touchscreen 360 degrees rotation, 180-degree flat display mode and 16:9 aspect ratio. The laptop features two options for its processor – Intel Celeron and Intel M3. The Intel Celeron version is available in two choices of 4 GB RAM / 32 GB flash storage and 4 GB RAM / 64 GB flash storage. The Intel M3 version offers 4 GB RAM / 64 GB flash storage. The Celeron model additionally supports the insertion of a memory card to increase the existing storage memory to 400 GB with a micro SD card reader. The light titan system has a silver and black color combination with a lightweight 2-in-1 design. 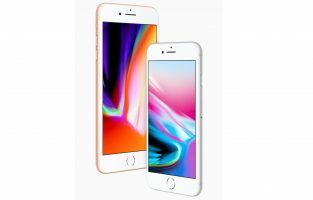 It has a built-in charging free pen, a 13 MP dual camera with auto-focus, two USB Type C ports, one USB Type A port, two 1.5 W speakers, a combo headphone/microphone jack and an internal microphone. The device also supports Wi-Fi 802.11 ac wireless data network. 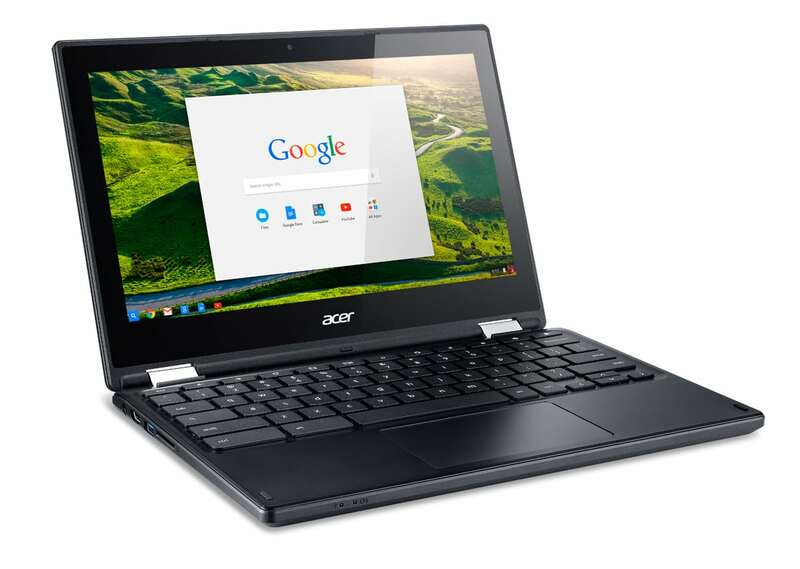 The Chromebook works with a 39 WHr lithium polymer battery that retains its juice for close to 10 hours on a charge. 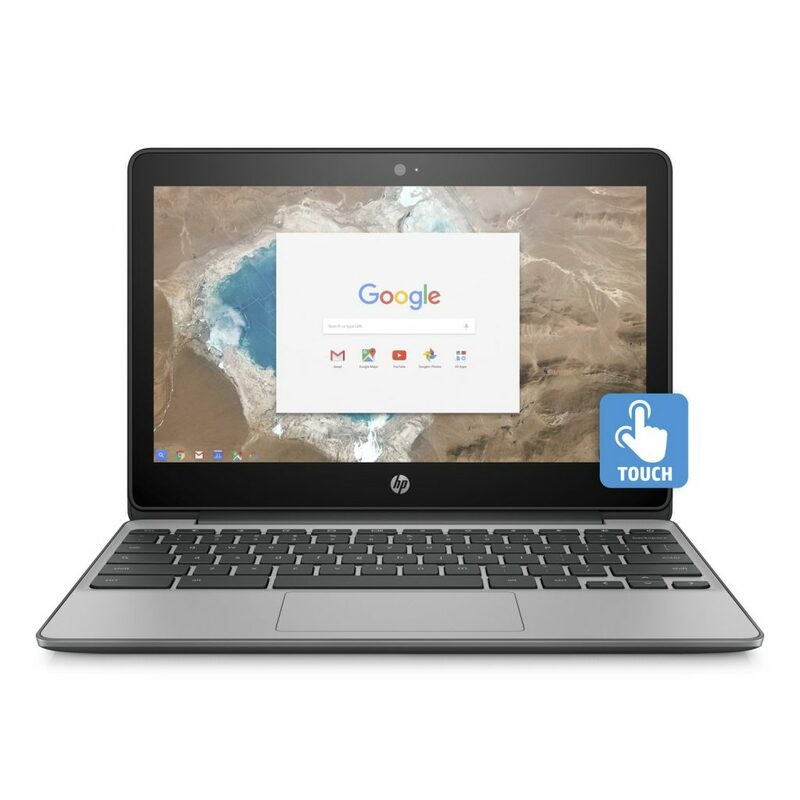 The HP Chromebook comes with an 11.6” HD eDP UWVA slim touchscreen with IPS display, 180 degrees hinge and Corning Gorilla Glass. 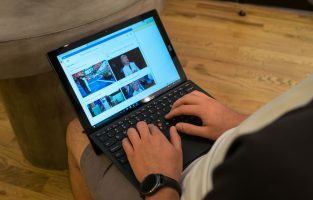 The laptop comprises 4 GB RAM, 16 GB flash storage, an Intel Celeron dual-core 11.6 GHz processor, an Intel HD graphics co-processor and 100 GB Google Drive space for two years. The black colored system features a full-sized island style spill-resistant keyboard, a micro-SD slot that supports a SD/SDXC/SDHC card to expand existing memory, a HD front-facing HP TrueVision webcam with an integrated digital dual-array microphone and two stereo HD Audio speakers with noise suppression. It also includes two USB 3.1 Gen 1 ports, a headphone/microphone combo jack, a HDMI 1.4 port and a security lock slot. The co-molded rubber edges enhance the durability of the device. The laptop supports a combo wireless data network of Wi-Fi 2 x 2 802.11 a/b/g/n/ac and Bluetooth 4.2. The Chromebook uses a 44 WHr three-cell lithium-ion battery that has a battery life of nearly 12.5 hours. 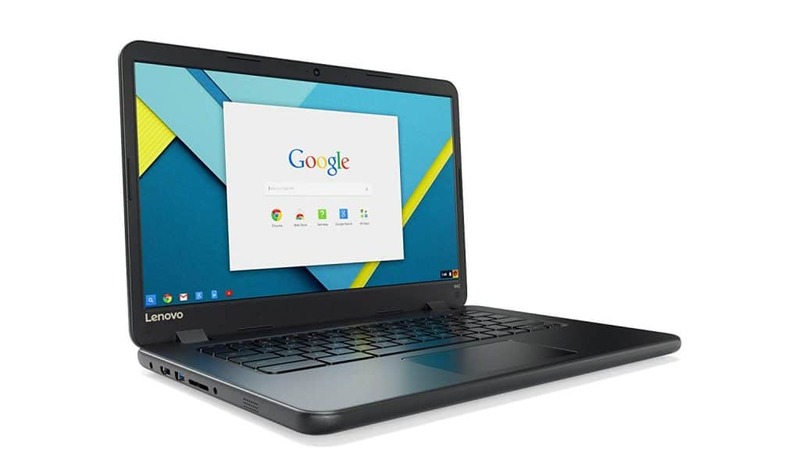 The Lenovo Chromebook comes with a 14” HD LED-backlit anti-glare display, 1366 x 768p resolution, an optional touchscreen, a 180 degrees hinge and 16:9 aspect ratio. The laptop encloses 4 GB RAM, 16 GB flash storage, a dual-core 1.6 GHz Intel Celeron processor that can boost up to 2.48 GHz and an Intel HD Graphics co-processor. The black colored system encompasses a sealed touchpad pointing device, a water-resistant non-LED back-lit keyboard with anti-peel anchored keys, a 2 in 1 media card reader, a 720p HD webcam with an integrated microphone and HD audio speakers. The device also incorporates two USB 3.0 ports, an HDMI port and a combo audio headphone/microphone jack. It comprises a fan-less design reinforced hinges and ports while being drop resistant up to 27.5” at the same time. The laptop supports dual-band Wi-Fi 2 x 2 802.11 and Bluetooth 4.1 wireless data connections. 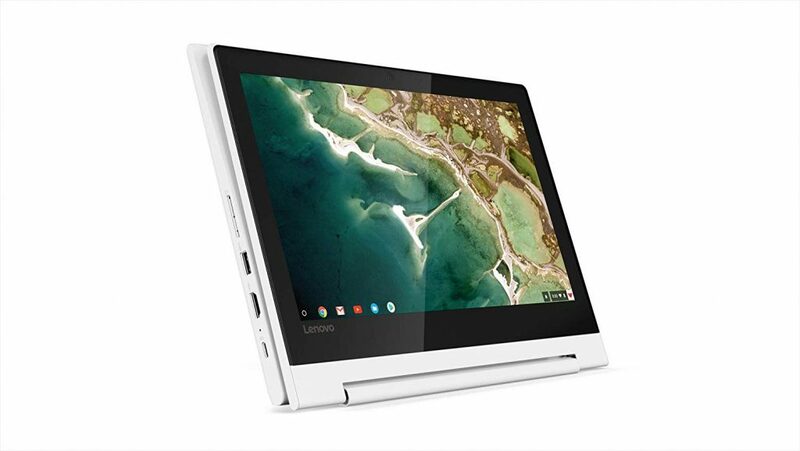 The Chromebook operates using a three-cell lithium polymer battery that works for nearly 10 hours on single charge. This is the list of the top best Chromebooks under $500 for you. 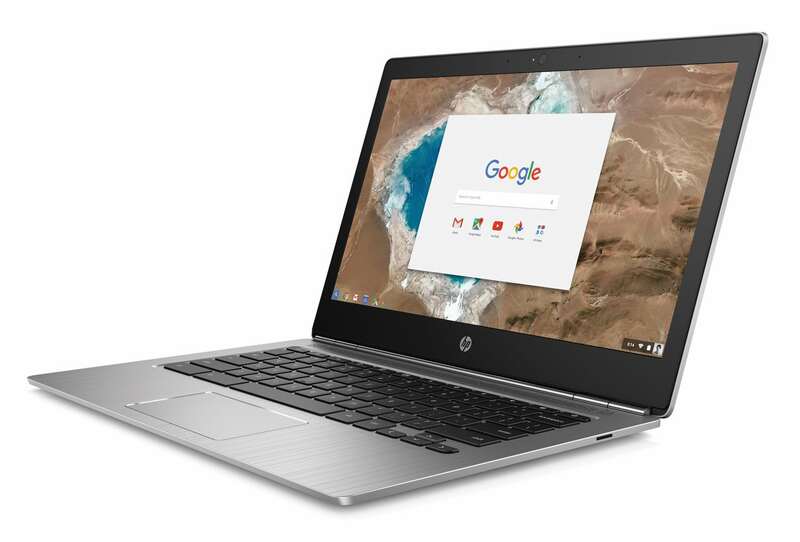 Buying a high-performing Chromebook under budget could be a tricky thing. 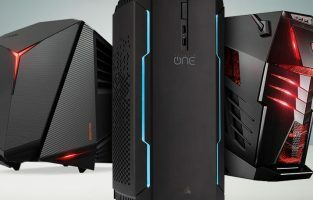 However, with this list, you can easily sort out your favorites among the leading Chromebook brands and then make the wisest selection. 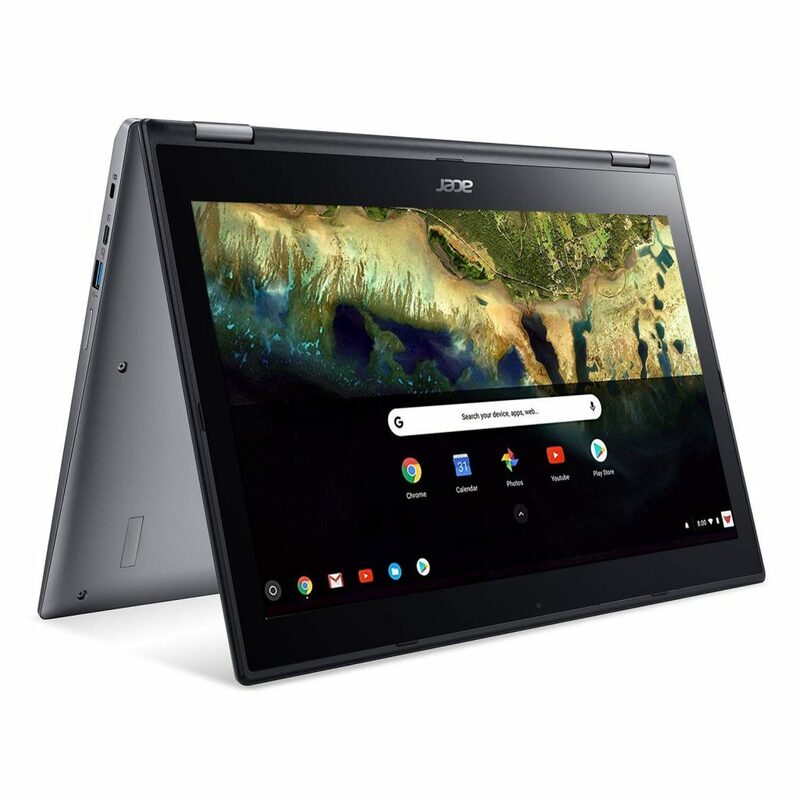 The Chromebooks have observed amazing technical advancements in the recent times both in terms of hardware as well as software specifications. With many more advancements taking place in the Chromebooks, one can expect it to overrule the laptops in no time. With a Chromebook, you are provided utmost web security and thus, these designs in your budget could be the best options out there.